forestière: 18 - mon nouveau vélo vintage! andrew and i picked up this wonderful vintage Bianchi cruiser from a small-town guy who fixes and sells bikes out of his yard in Pembroke, ON. i feel like we stole it, it was such a great deal! all she needs is a little bit of lovin'. 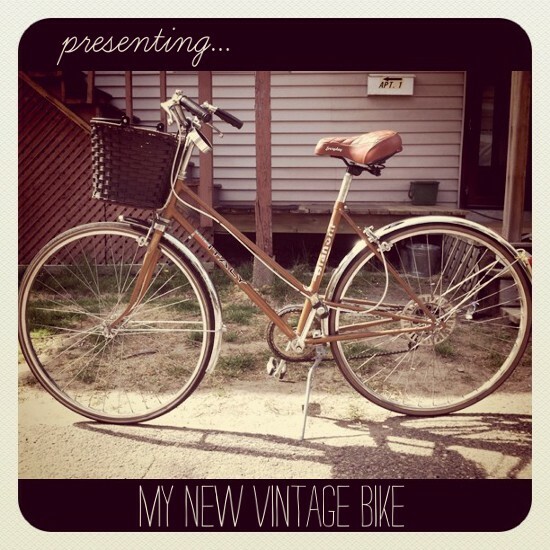 i already splurged on a new vintage-inspired saddle seat and market basket! we still need to tune her up some, but i am hoping she'll be ready for the weekend. i now totally understand the appeal of vintage cruisers... i feel like a country bumpkin riding her, it's so relaxed and fun! can't wait to take her to the market... i think she is going to be absolutely perfect for cruising around Montreal this summer. my sister insists that i call her Gertrude, but i am just not feeling it. what do you think?